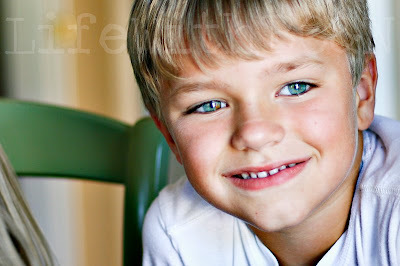 our perfectly imperfect life: Love.This.Kid. It is so bittersweet, to have a kid growing up so fast. I miss my baby, but I thoroughly enjoy Mason and the funny things he says. I find myself having to remind myself that he is only five and really is still just a baby at heart. Lately I've sort of been feeling sorry for Mason. I am often so busy with the girls, that I hate to think that Mason is just sort of along for the ride, so to speak. How many five year old boys spend most days traveling to doctor appointments and therapy? How many five year old boys even know what therapy is? I guess the good thing is that Mason knows no different. And I know that he is a million times blessed to have the sisters that he has, despite all the extra time we have to spend on them. I have been trying to make an effort to spend more one-on-one time with Mason. Whether it is dragging him along to get my coupon deals ... haha ... or just reading a book, I cherish the time we have together ... alone and uninterrupted. Judging from that picture, he'll get all your attention during those high school years. What a gorgeous son you have. You're going to be beating the girls off with a stick! Ha ha! He is such a doll, so cute! I have got to take photography lessons from you! All of your pix are sooo good! I have my new camera, now just need lessons! He is so sweet. They do grow too fast. Awwww, you are doing great, and what a great boy Mason is :)))!! Such a handsome boy. I didn't know he had such blue eyes! I wonder about all my kids... whether they're getting enough attention, but there's no doubt that their lives are much richer by having John Michael and others with Ds around them. Oh how I feel ya on this one! My Hunter man is 5 also and I too feel sorry for him a lot. I know that he will be a more compassionate person as an adult because of his sister (right?) but it's still not fair that SO much of his time is spent on traveling to and from things for his sister, sitting and watching her etc. I know he doesn't know any different, but I do. Man I wish we lived close by eachother, these two would hit it off big time!! !